Blueberry Sorbet #2 of 2: Blueberry Basil Lemonade “Sorbet,” with scare quotes. | ostrich milk. Blueberry pancake breakfast, deconstructed, part 7. 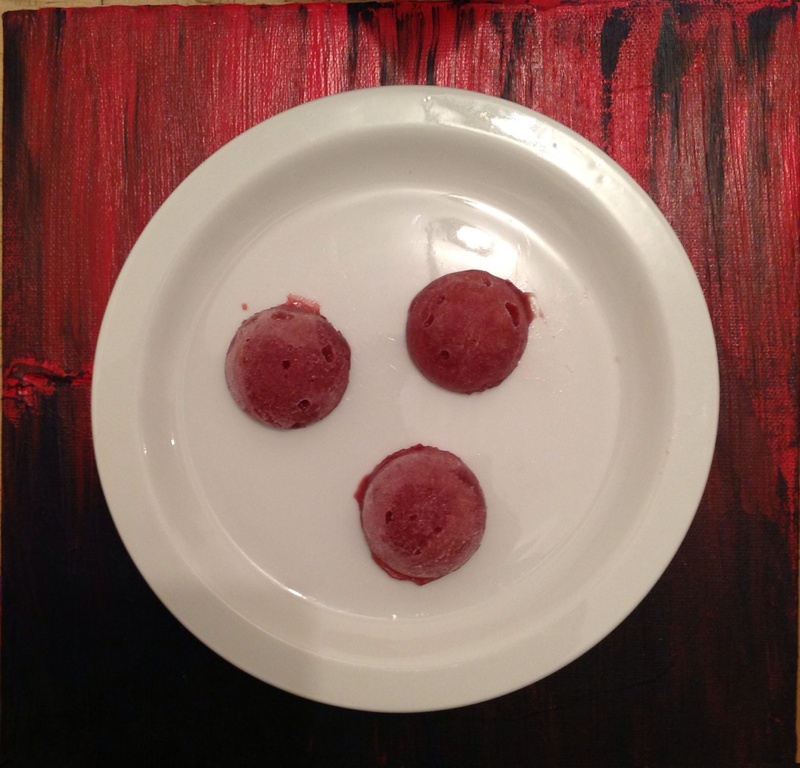 Blueberry Sorbet #2 features the waste products of bacteria. Somehow, it ends up tasting like tart, sticky raspberry. It lasts for weeks. Flavor: Tart raspberry?!? Sticky, almost gummy. A bit of a bean-y aftertaste from the guar gum, but the hydrocolloids will allow it to retain its shape as it defrosts, eventually leaving a sticky berry sauce. Make basil syrup. Here’s how. Chill the syrup. Make xanthan-guar foam. (Again, that’s guar, not GWAR.) Mix 1/3 cup chilled lemon juice. Add 2 tsp xanthan gum and 1 tsp guar gum. (This is a huge amount of hydrocolloids; any more and the foam will become immobile) Blend, ideally with immersion blender, until a foam begins to grow. This will not take long. Integrate the mixture. Whisk or blend foam mixture into mixture of 1 cup syrup and 1/2 cup blueberry juice. Spoon mixture into hemispheric silicone molds. Freeze. The foam will settle, somewhat. The extreme hydrocolloid and sugar content should prevent the mixture from even becoming solid. The hemisphere will retain its shape as it melts on the plate, making a questionable reference to blueberries in a pancake. This entry was posted in Blueberry, Studies and tagged blueberry, deconstruction, dessert, frozen, guar, hydrocolloids, lemon, recipes, Sorbet, Studies, xanthan. Bookmark the permalink. 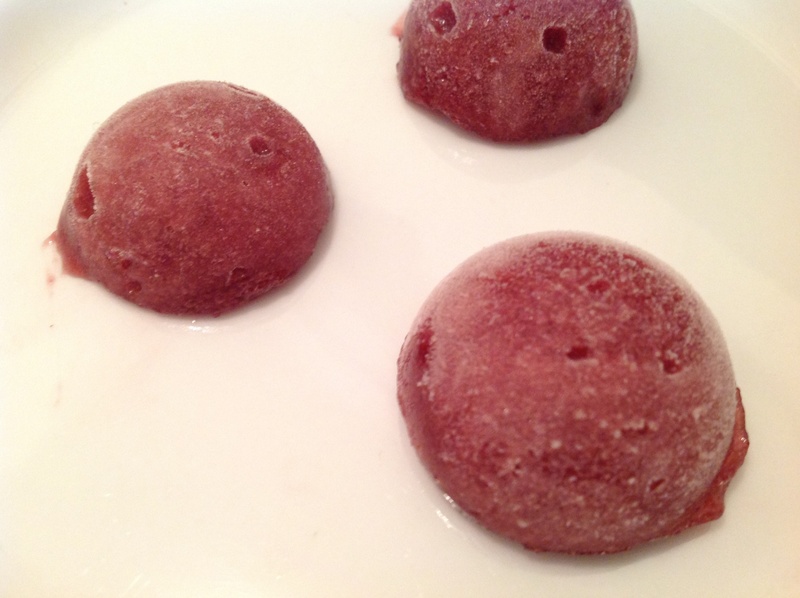 Blueberry Sorbet #1 of 2: Blueberry Shrub Sorbet.